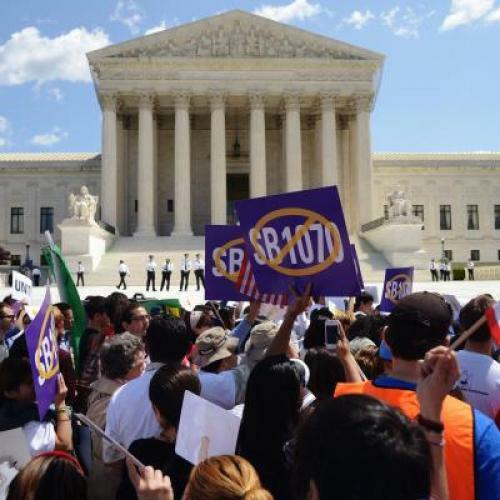 The Supreme Court on Monday struck down most parts of Arizona’s immigration enforcement law, leaving in place the most controversial element but in a way that suggests it may not last for long. The Court announced no decision on health care reform, delaying that until a final session to be held on Thursday. Monday’s decision on “papers please” rested on the more technical issue of whether the law unconstitutionally invaded the federal government's exclusive prerogative to set immigration policy. The justices found that it was not clear whether Arizona was supplanting or supporting federal policy by requiring state law enforcement to demand immigration papers from anyone stopped, detained or arrested in the state who officers reasonably suspect is in the country without authorization. The provision that was upheld—at least for now—also commands police to check all arrestees’ immigration status with the federal government before they are released. The invocation of personal stories is a signature Kennedy touch. His willingness to side with the government, on an issue involving the boundaries of state and federal power, might also be an encouraging sign for supporters of health care reform. Even though the court has temporarily allowed the “papers please” provision to stand, Kennedy's opinion suggests it will not survive unless the state courts, which must review the statute, construe it incredibly narrowly. The Arizona verdict, which largely affirmed the position of the Obama Administration, is also proof that oral arguments aren't always indicative of outcomes. Solicitor General Don Verilli took a serious beating from the justices in that case, just as he did during the health care arguments. But critics of health care reform could also see this as a good omen. Kennedy has a habit of giving wins to both ideological sides in any given term, although it's not a hard and fast rule. Monday's decision to strike down the Arizona law was one of two in which he sided with the court's liberals. The other was a decision, written by Justice Elana Kagan, holding that life without parole for minors violated the constitution's prohibition on "cruel and unusual" punishment. So we really don't know anything more about the health care case than we did an hour ago, except for this: A decision is definitely coming on Thursday.